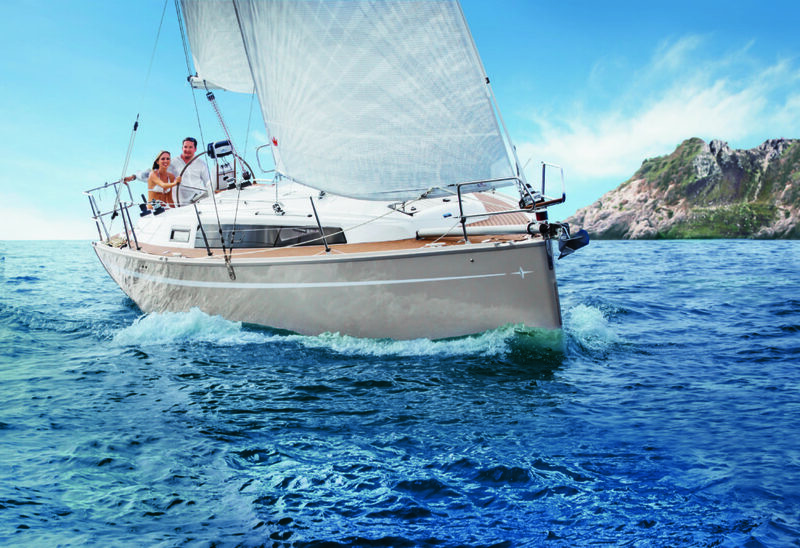 A smaller yacht with bigger performance. 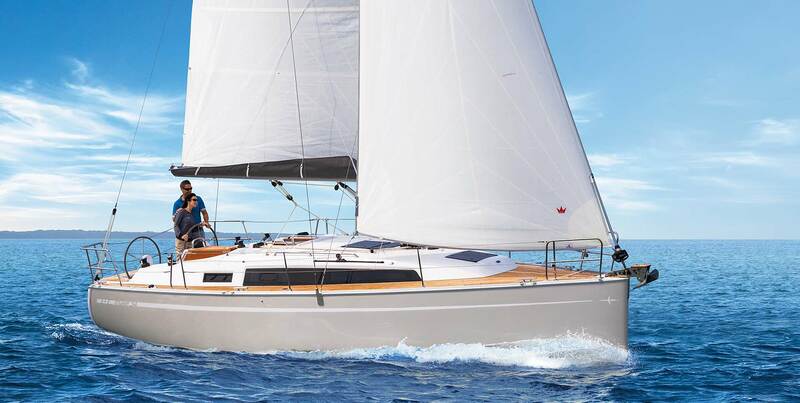 The Farr designed Bavaria Cruiser 34 has a sporty profile, a single or twin helm option, a very comfortable layout and is a delight to sail. 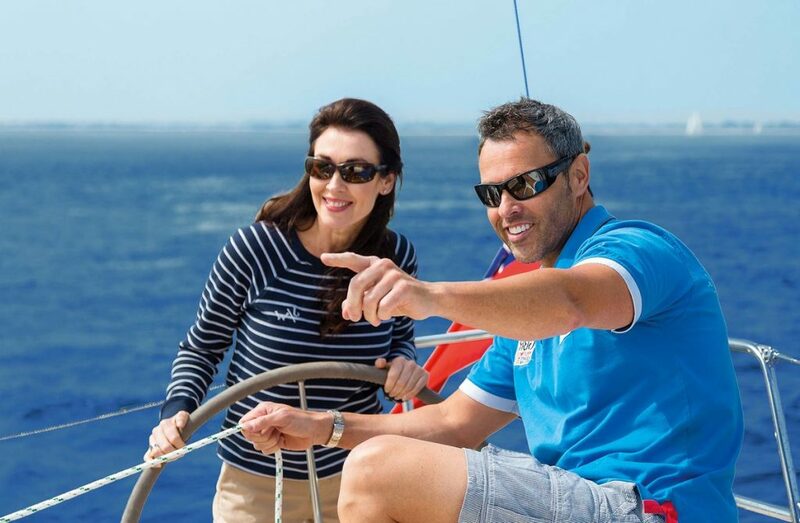 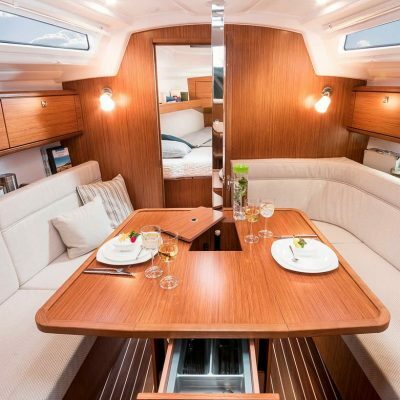 This is a smaller yacht with big yacht performance and will suit a couple, or a family sailing together. 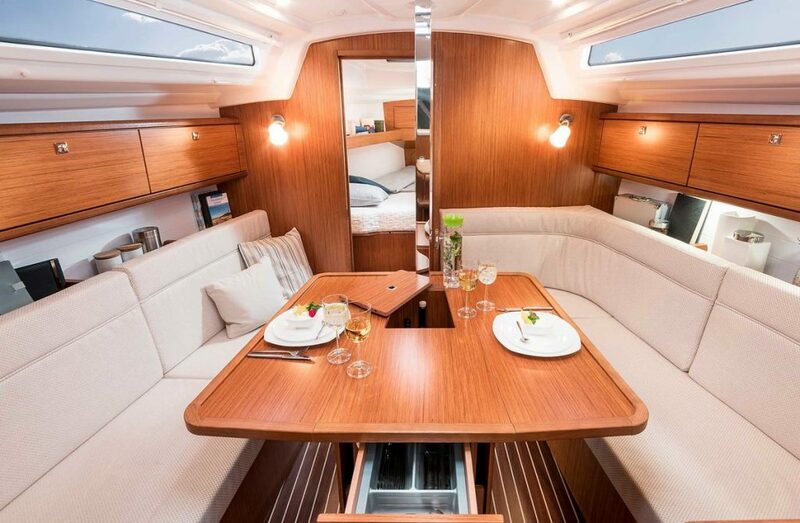 She is light and fun but also smartly thought out, making her capable of extended cruising. 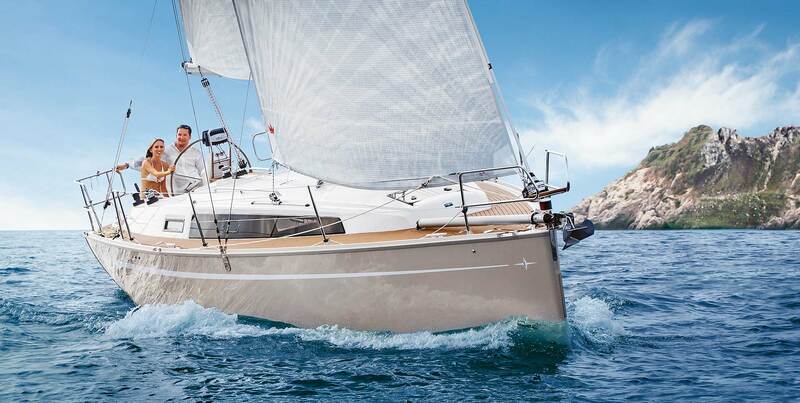 But most of all, the Bavaria 34 shows just how easy sailing can be. The Bavaria 34 has plenty of well-conceived ideas and there is no compromise made to comfort and ease of sailing. She is the ideal small boat for the Caribbean. 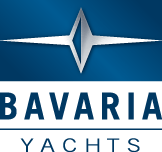 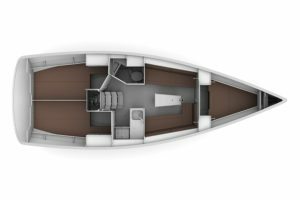 Or scroll down for a more detailed overview of the Bavaria 34. 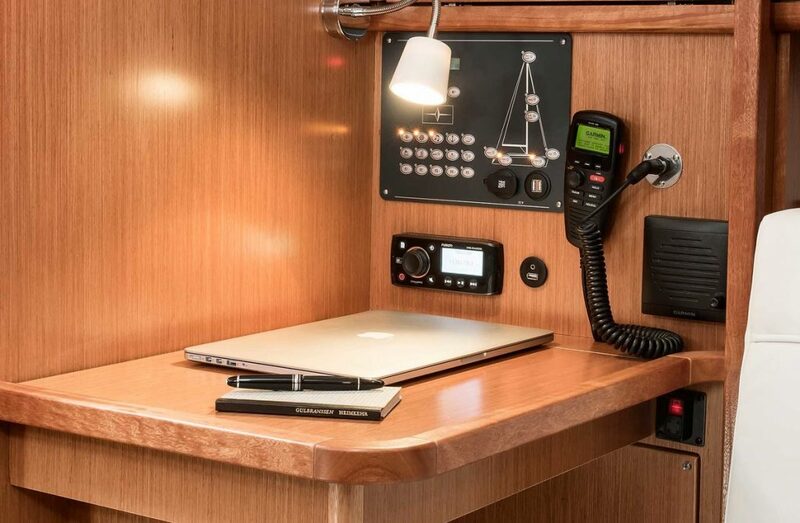 Sailing instrumentation is at the starboard wheel with the chart-plotter centered on the back of the cockpit table. 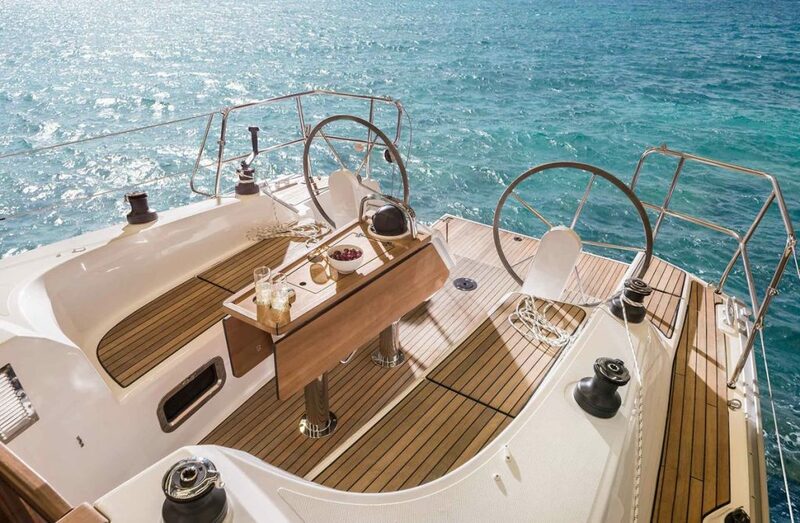 The twin wheel always gives the helm a perfect view of the sails from the favored side of the boat. 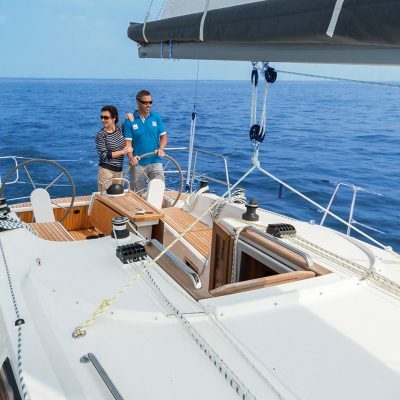 The furling mainsail makes sailing short-handed a breeze and the reefing simple. 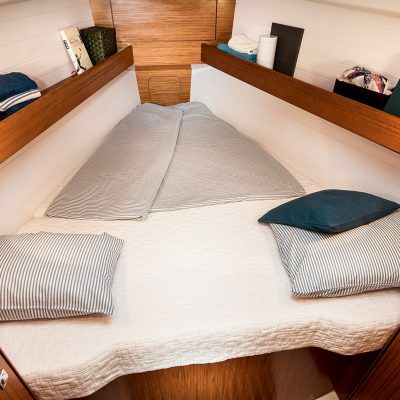 (A full battened mainsail is an option). 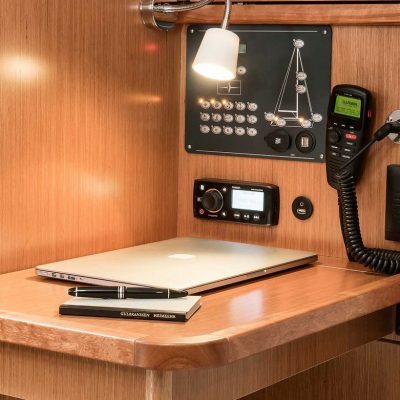 Sail trimming is further simplified with the main sheet led to the cabin top winch and the furling jib trimmed to cockpit winches. 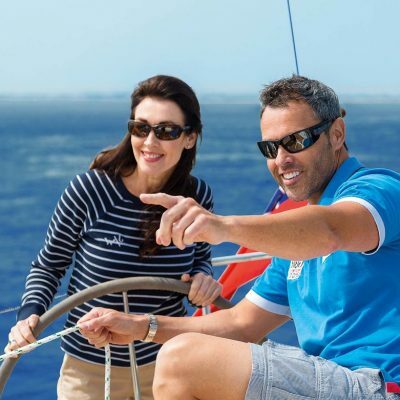 Look forward to over 6 knots upwind in medium wind. 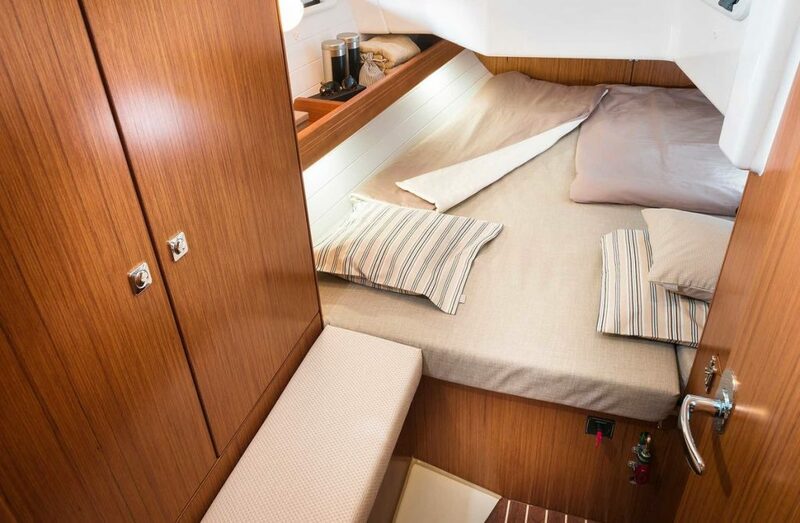 The short jib tracks are on the cabin top giving narrower sheeting angles for better upwind performance. 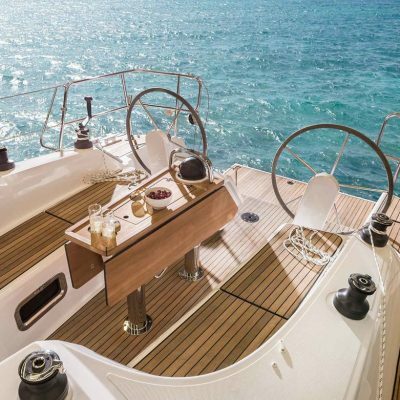 Plus the shrouds are set aft so getting forward on deck is clear. 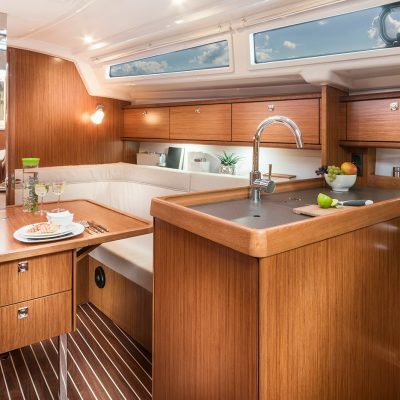 Bavaria always combines comfort with safety and there are plenty of grab rails all around, so it’s always easy to hold on whether in the cockpit or below. 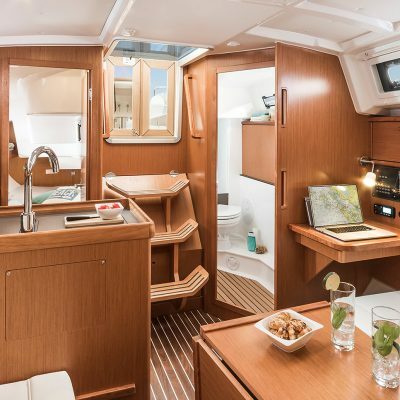 Getting aboard is easy, the teak-covered drop-down swim platform is wide and nicely balanced and is easily lifted with one hand. The twin wheel option gives a perfect walkway through to a very spacious teak decked cockpit. 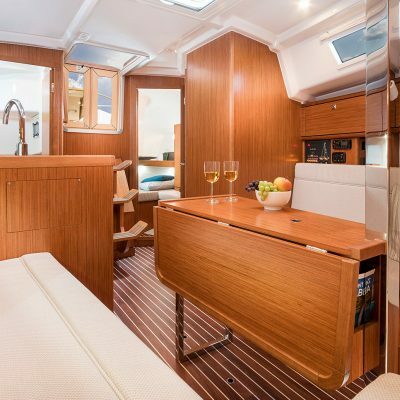 Ergonomic cockpit seats make relaxing even easier and a large cockpit table makes the whole area ideal for entertaining when the sailing is finished for the day. 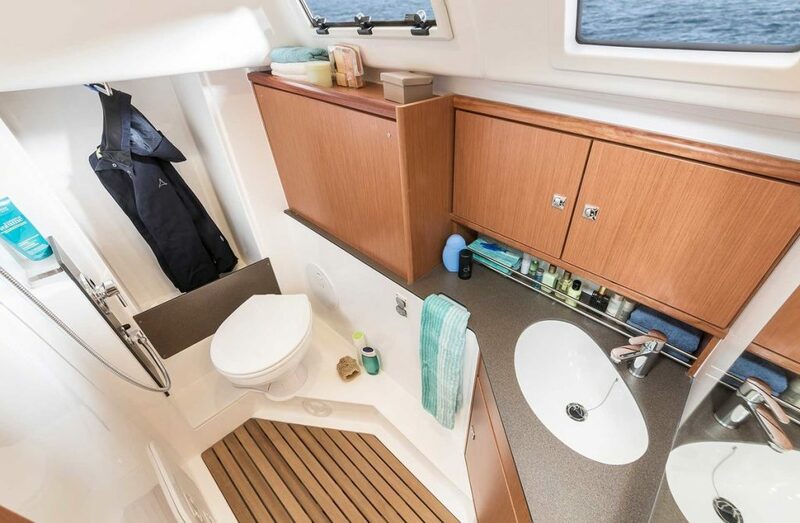 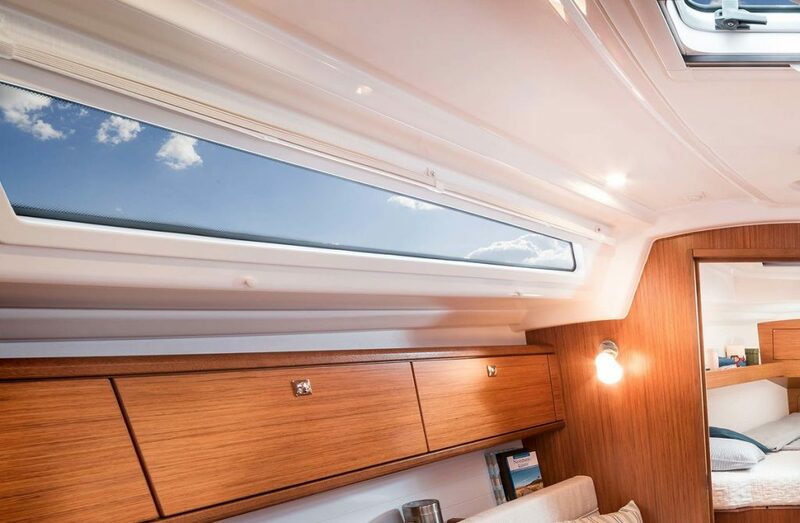 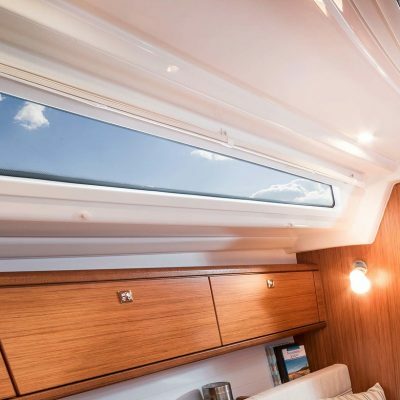 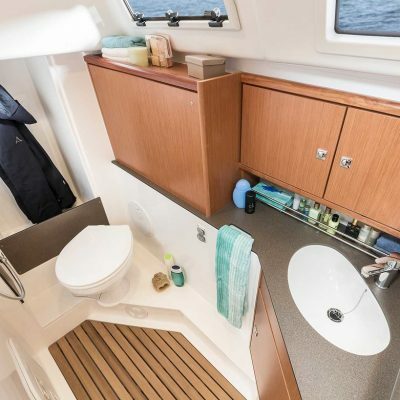 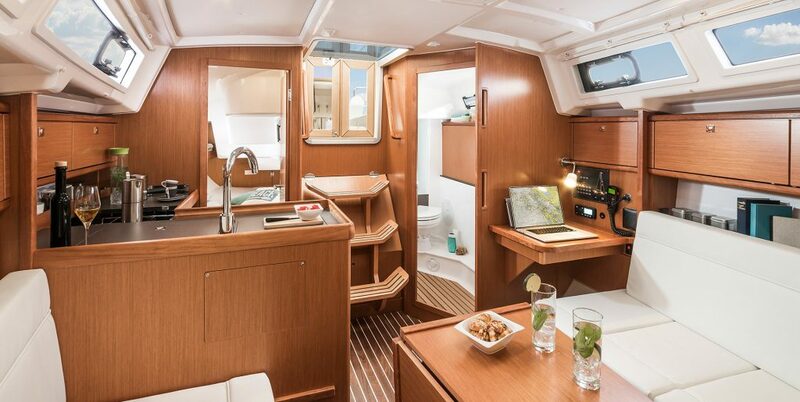 The bavaria cruiser 34’s saloon is surprisingly large and airy with comfortable bench seating, quality wood finishes, and two hatches above the saloon table add even more natural light. 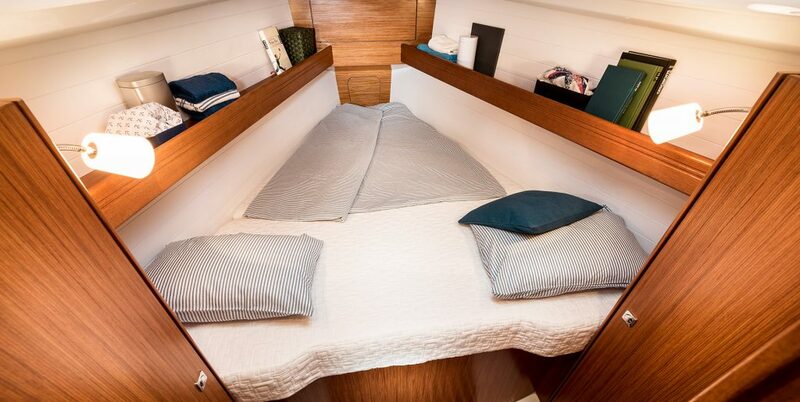 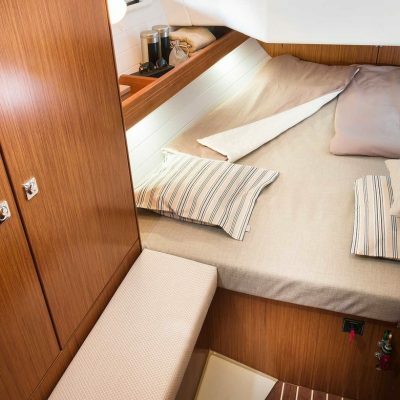 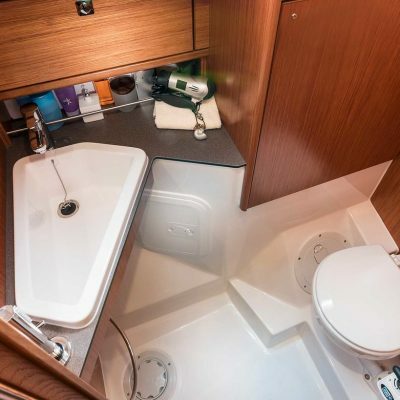 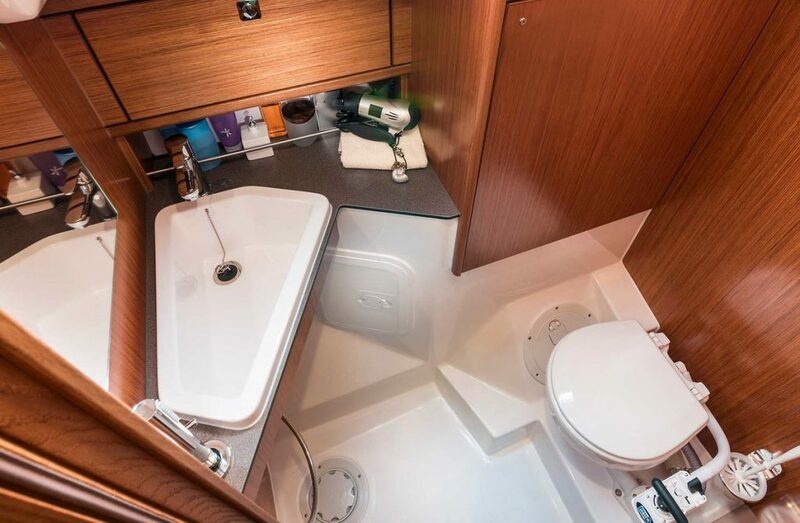 There is plenty of room in 3 cabins for six below, and in the two cabin version, there is an impressive extended head/shower on the port side. 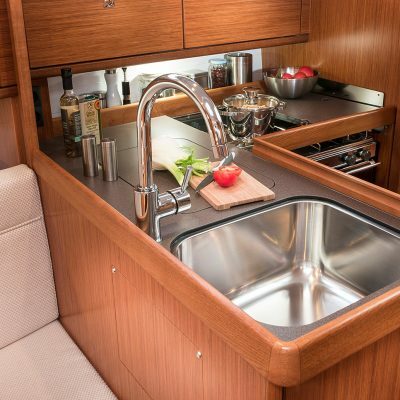 The L-shaped galley has a single sink, a two-burner stove, and a top-loading refrigerator. 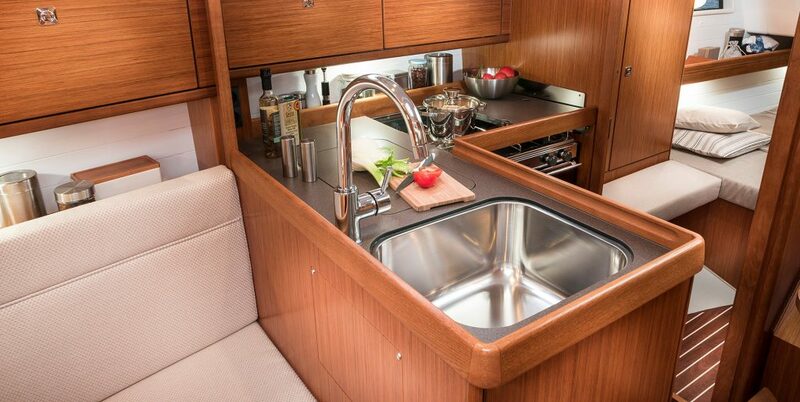 Compact and functionally designed, it ensures providing meals and snacks for up to six is simple. 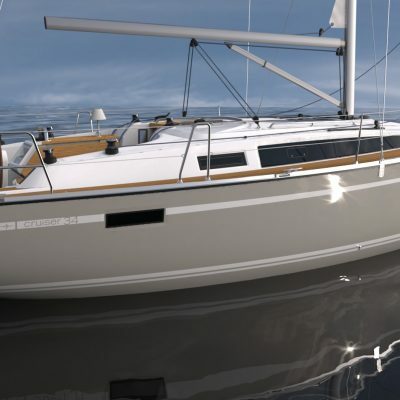 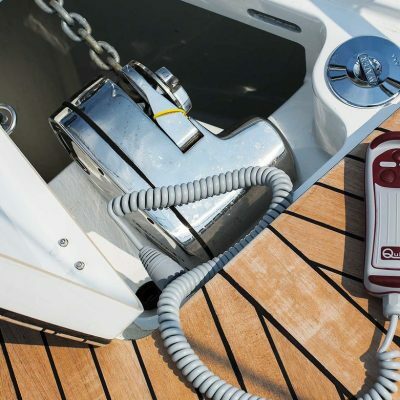 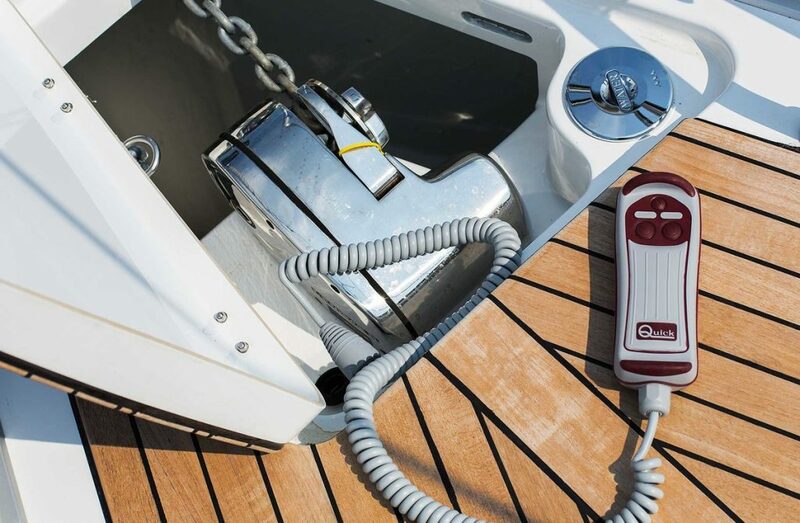 The Bavaria Cruiser 34 is accomplished under power. 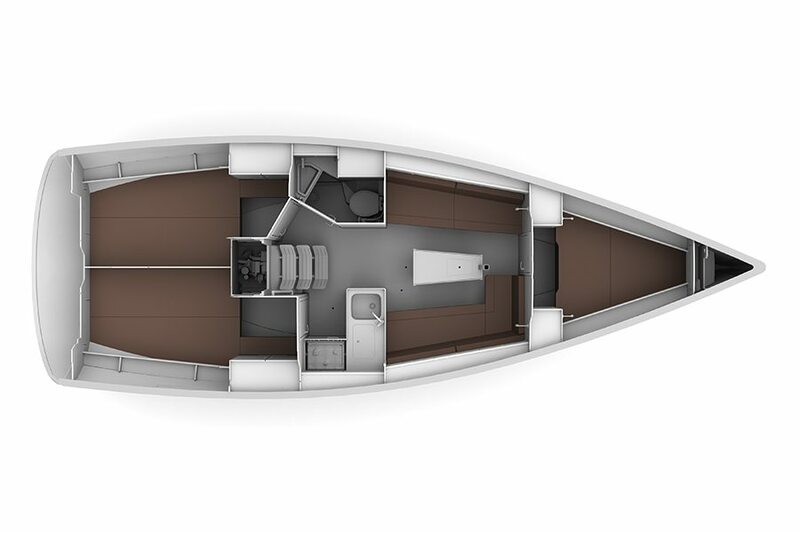 The upgraded 30HP Volvo Penta diesel engine fitted with a folding three-bladed propeller is recommended. 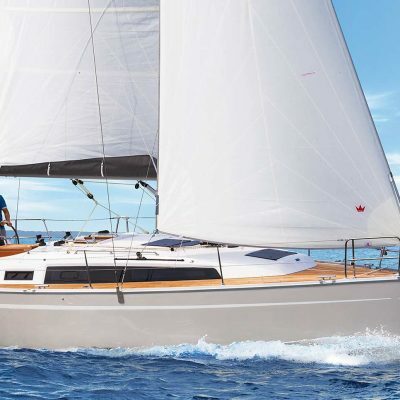 She handles nicely and cruises at just over 6knts at 2400rpm in slight chop. 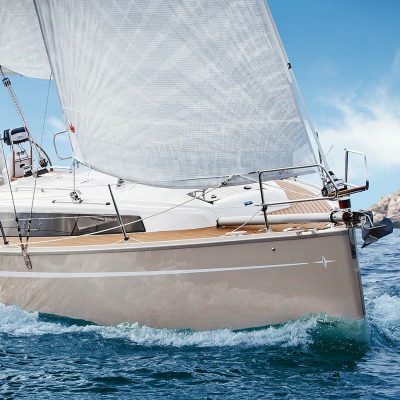 If you would like to buy a Bavaria 34 for private use, or for placing in our highly regarded charter fleet in the Caribbean, or would simply like to learn more about this or another Bavaria model email Robin Hodges. 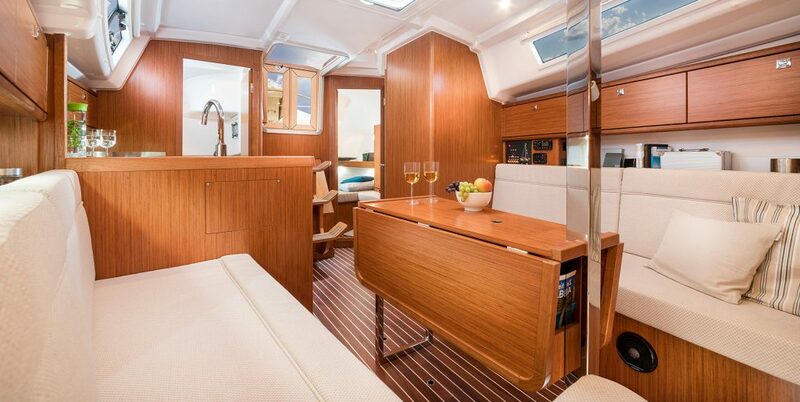 robin@horizonyachtcharters.com Full contact details for our team can be found here.